Tina Packer’s "Women of Will"
The Nora Theatre Company will present Tina Packer in her masterwork, "Women of Will," from October 13 - November 6 at Central Square Theatre, 450 Massachusetts Avenue in Cambridge. "Women of Will" features a two-part schedule. For the first three weeks -- October 13 - 30 -- the theater will present "The Overview," offering highlights of the five-part "The Complete Journey," which will then be presented in the final week (November 4 - 6). Specially priced packages are available, including dinner at restaurants in Central Square, for patrons who wish to attend all five parts of "The Complete Journey." Ms. Packer, Founding Artistic Director of Shakespeare & Company, has spent 40 years immersed in the investigation of all things Shakespeare and ranks as one of the leading experts on Shakespeare, not only in America but in the world. A combination of riveting scenes and lively analysis, "Women of Will" explores themes of love, loss, freedom, control, violence and power through the heroines of Shakespeare’s text. Ms. Packer will perform with her acting partner, Nigel Gore. "Women of Will" will be directed by Eric Tucker. Packer and Gore have performed opposite each other in several productions, including "Who’s Afraid of Virginia Woolf" (which earned Gore an Elliot Norton Award for Best Actor in 2010), "Antony & Cleopatra," "Hamlet," and "Coriolanus" (Packer’s all-male version presented in England last year). All three artists have been working together for the past two years fine-tuning "Women of Will, The Complete Journey" guiding it from a workshop piece to a fully-realized, five-part series. In the spring, they tried it out on audiences in Los Angeles, San Francisco and North Carolina. Following the run at Central Square Theater, performances will take place in Colorado Springs, with an extensive cross-country tour planned for 2012. 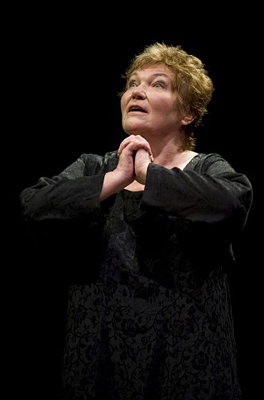 On "Women of Will," Ms. Packer commented: “When I began work on this piece 12 years ago, through a Guggenheim grant, I knew it was an unusual journey and a hybrid as far as theatrical performance is concerned it is a performance, but it’s also a discussion, a debate (as all Shakespeare’s plays are, in essence). The dramatic tension in the piece comes from influences in Shakespeare’s life, as well as my desire to show how powerful and distinct the women are in his plays." At two hours each, each play stands on its own. Collectively, audiences will understand more about Shakespeare than they probably thought possible. For tickets and information, stop by the box office, call 866-811-4111 or visit CentralSquareTheater.org.